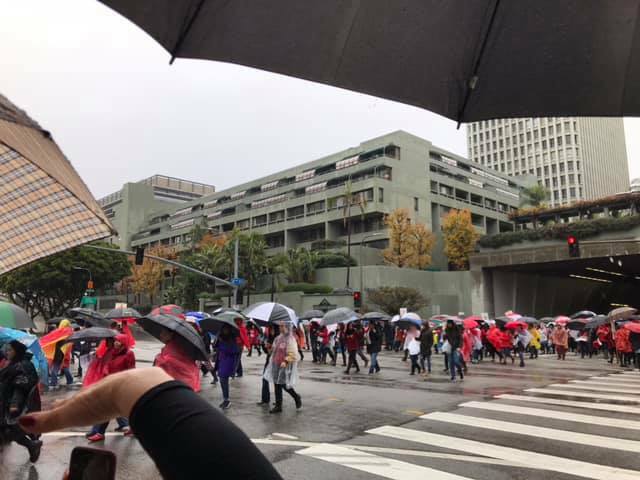 After another morning of pickets, while teachers were on their way to another rally in Grand Park, UTLA announced that a tentative agreement had been reached. After an afternoon meeting and voting at school sites, the majority of UTLA members voted for the agreement. Everyone will return to the classroom tomorrow. This would not have been possible without the power of collective action and the support of parents, students, community members, and other workers. The negotiations are going well but there is not a tentative agreement yet. There is a 10:30 rally and march starting at Grand Park to LAUSD Headquaters on Beaudry. 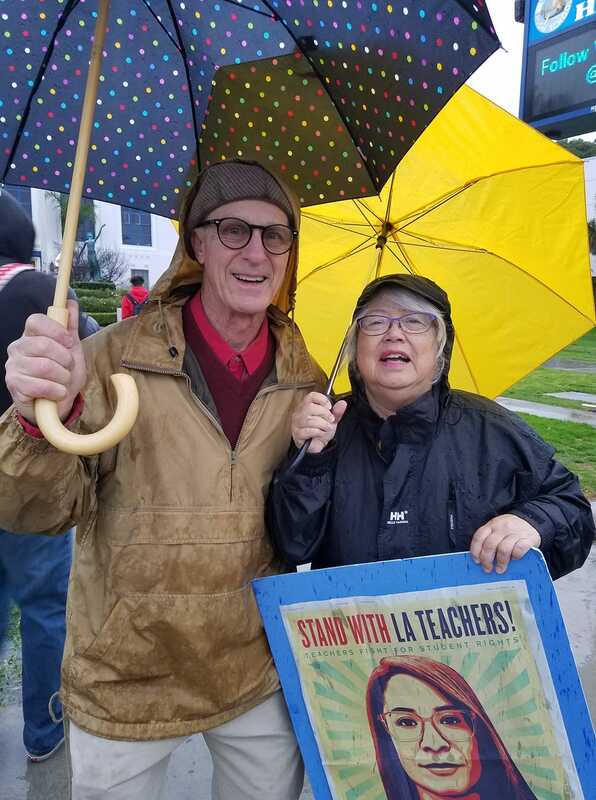 The rain finally stopped but the picketing continued and UTLA ended the week strong with another massive rally in Grand Park. Negotiations will continue through the weekend. UTLA will have a contingent at the Women’s March. Their group is meeting at Olive and 5th. 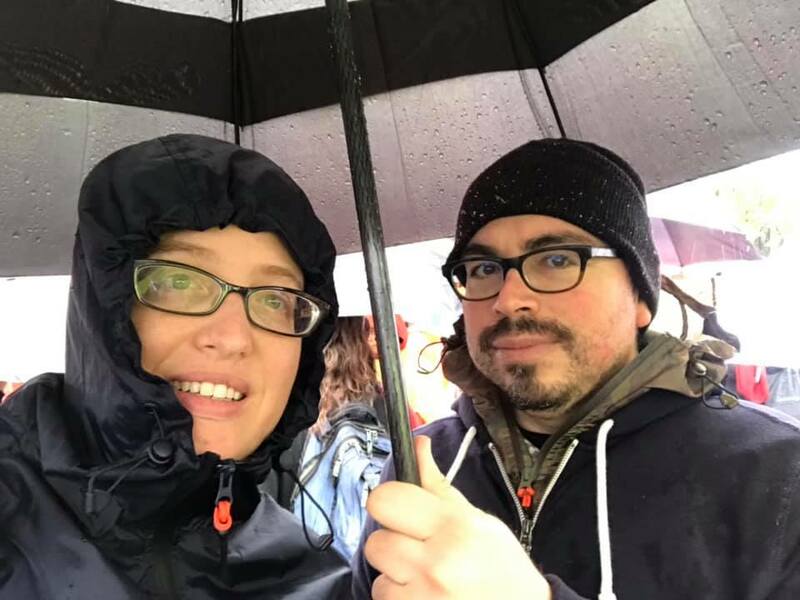 More rain and more strong showings at the picket lines and with local actions. There were 10 banner drops around the city! The negotiating team has been in meetings all day into the night and negotiations will likely continue through the weekend. A local elementary school student wrote and recorded “This is a Strike Song” in support of the teachers. How do we book her for a church service? We stayed strong for the third day in the rain! After morning pickets there were actions at the various regional offices. Thousands of teachers, students, parents, and community members showed the power of collective action. Starting tomorrow, UTLA and LAUSD will go back to the bargaining table at LA City Hall where Mayor Garcetti will act as a mediator. Tomorrow pickets will continue in the morning from 7 – 9 am and in the afternoon from 2:30 – 4 pm. There will be local actions in the middle of the day. Check with the strike captain at your school site for details. Teachers, parents, students, community members and other workers made another strong showing today! The picket lines were fuller and at least 50,000 workers came out to the mass action at the California Charter Schools Association. Let’s keep up the momentum! 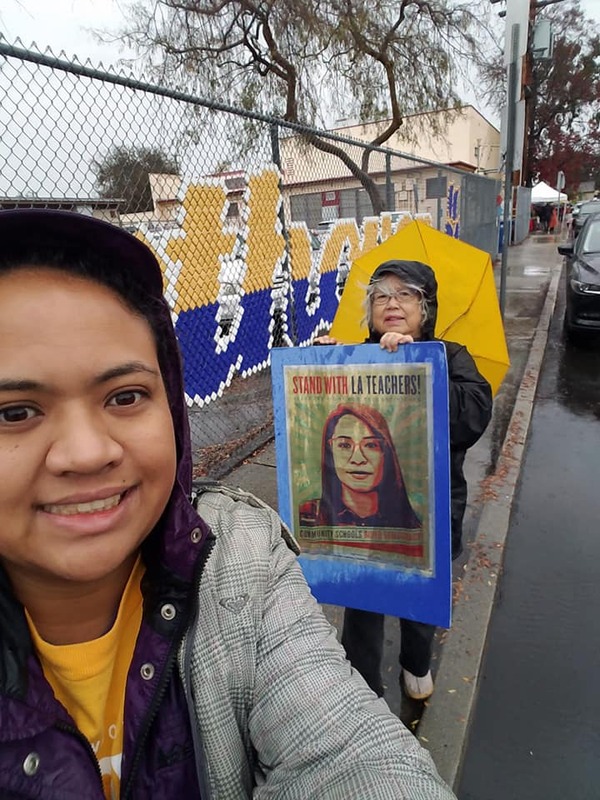 Pickets from 7 – 9 am and 2:30 – 4 pm! Tomorrow the 10:30 actions will be at the area offices. The West Area office is at Daniel Webster Middle School! The pickets and the march downtown were very successful. 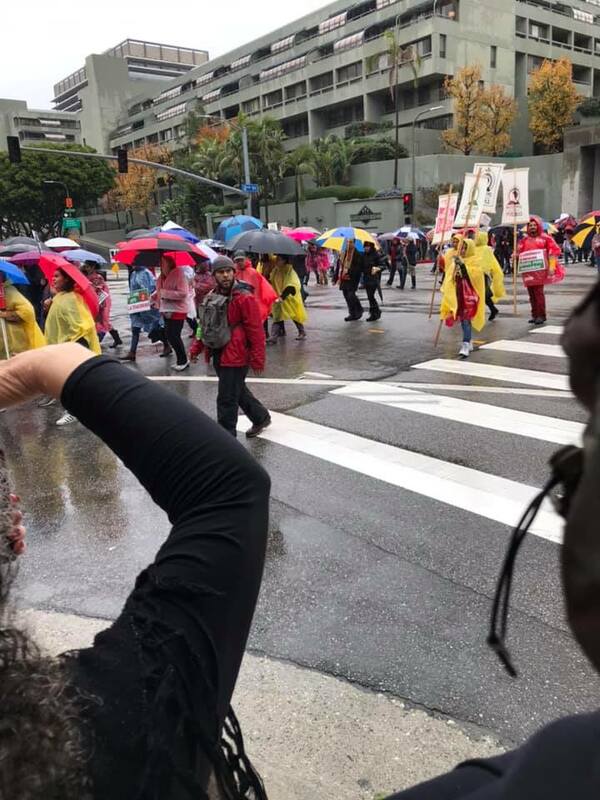 Over 50,000 teachers, school workers, parents, students, and community members took over the streets from Grand Park to the LAUSD headquarters on Beaudry! 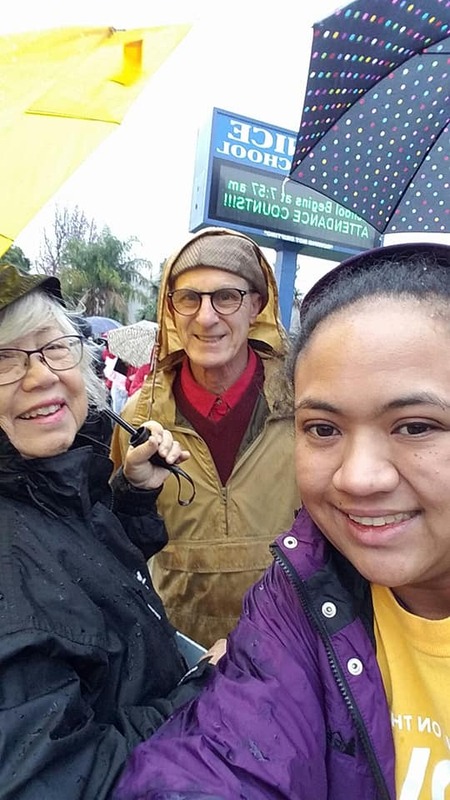 In addition to Daniel Webster Middle School, congregants went to Venice High School, Los Angeles High School, Beethoven Elementary School, University High School, Westminster Elementary, and Broadway Elementary! The teachers of LAUSD are poised to go on strike and the Faith in Action Commission is supporting their struggle. We are adopting Webster Middle School (11330 W Graham Pl, LA 90064) and Clover Avenue Elementary School (11020 Clover Ave, LA 90034). The start date for the strike is Monday, January 14. There will be pickets every morning from 7-9 am and every afternoon from 2:30-4 pm. There will also be mass actions at 10:30 am every day of the strike that will be announced at 4 pm the afternoon before. On Monday, January 14 the action will be at Grand Park in front of City Hall. On Tuesday, January 15 the action will be at California Charter Schools Association, 250 E 1st St LA 90012. It would be great if people could commit to at least one morning or afternoon picket a week or helping with supplies. We chose these schools because they are close to the church. If you live near a different LAUSD school, please reach out. We also have friends that teach at Washington Prepatory High School and LA High School. We want to get as many people as possible to come out on the first day of the strike to really show that the workers in the area support the education workers of LAUSD.